SuperValu’s Signature Tastes, Food Academy and own-brand ranges for time-saving, flavour-packed party snacks. 1. To make the pink grapefruit mayonnaise, mix the mayo, crème fraîche and grapefruit zest and juice together in a small bowl until well combined. 2. For the mango dip, mix the mango chutney with the zest and juice of the clementine. then refresh in cold water. Set aside. 4. In a medium bowl, beat the egg and water together. Add the flour, salt, fennel seeds and chilli flakes and beat until the mixture forms a smooth batter. 5. Pour the vegetable oil into a deep, heavy-based pan so that it reaches two-thirds of the way up the pan and heat until a drop of batter sizzles and turns brown when dropped in. 6. 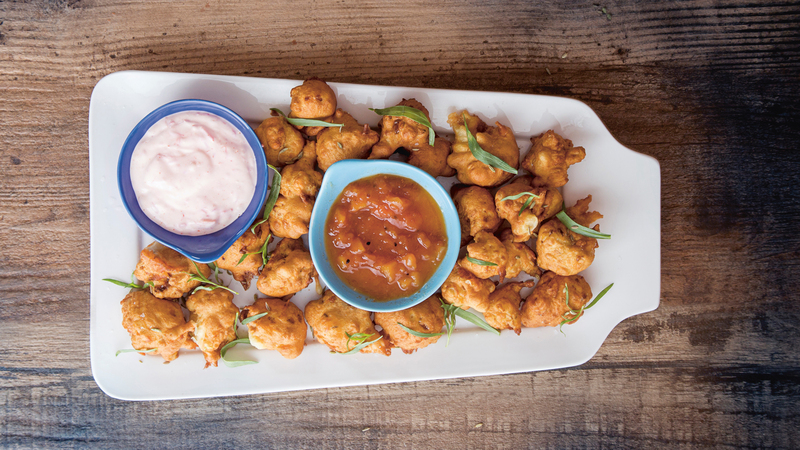 Working in batches, dip the drained cauliflower florets into the batter, then carefully lower them into the hot oil using tongs. Deep-fry for 3 to 4 minutes, until crisp and golden brown. Carefully remove from the oil using a slotted spoon and set aside to drain on a plate lined with kitchen paper. 7. Repeat with the remaining florets. Serve warm, sprinkled with tarragon leaves with the dips on the side. You can make the batter and dips the night before, then use the batter directly from the fridge.